Welcome to our series on how to have a positive influence on others for Christ. We want to give you some tips on sharing your faith and give you an example of how to use this in real life. The most important tip is to find out where the people are on their spiritual journey so you will know how to encourage them no matter where they are. Some will be open to God and seeking Him. In that case, I usually show them the Share Your Faith app. 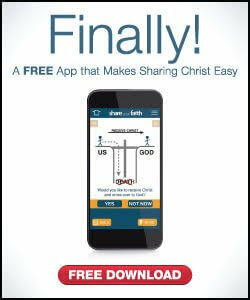 That makes sharing your faith really easy. For example, while at physical therapy, I led the assistant therapist to Christ using the Share Your Faith app. Some will be far from God. In that case, I seek to be a positive influence on them for Christ. I avoid being pushy because that could push them away from Christ. I just want to encourage them and point them in the right direction. God is not finished with them yet. Some will already be believers. When talking with them, I usually find out about areas where they need encouragement. A couple of weeks ago, I met a woman named Linda when our Monday lunch group went out for Pizza. “Water of Life?” I asked. I told her about another girl at Starbucks who was in the same situation. She prayed and then asked the manager if he would allow her to have Sundays off so she could go to church and get closer to God. The manager said yes and gave her Sundays off. Linda said, “That gives me hope.” Then she said, “My manager is right over there” and pointed him out to me. Later, when getting a refill, the manager was there, and I affirmed him of the two employees at the front counter. He asked where our group was from, and I told him that we were a group of friends from church. We have lunch together every Monday. He said he likes to make donations to church events. I told him that we were all involved in a ministry to families who have kids who have cancer. Then I called over Pam, the leader of the ministry. She told him about the six major theme events we put on for about a hundred families who have kids with cancer and the kind of gifts we always give them at those events. The manager wanted to contribute to that ministry said gave Pam 50 free pizza dinner cards to give to the parents of those families. To me, that was clearly a divine encounter. God put us together so several people could be encouraged. It all began by opening up a conversation with Linda and seeking to find out where she was on her spiritual journey. Even though she was already a Christian, God obviously had special reasons to bring us together.